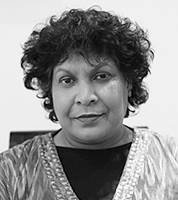 Dr Sharmala Bandaranaike, DSAC;MBAcC; Ac. (Peking) MAMA (UK) MAcF(Sri Lanka). Dr Bandaranaike qualified in Ayurvedic Medicine in Sri Lanka and in Acupuncture both in Sri Lanka and in China. She was senior consultant at the Tyringham Clinic for 15 years and then, 10 years ago, joined the Harrold Medical Practice in Bedford, as a visiting consultant and acupuncturist. Dr Bandaranaike is a senior member of the British Acupuncture Council and has been nominated to chair their annual conference in this year. If you would like to make an appointment with Sharmala, please contact us on 01933 664444.